TWO MILE HOUSE have been dealt a massive blow ahead of their All-Ireland club championship campaign. Defender Peter Kelly (24) – an all-star in 2010 – will miss their semi-final clash against Emyvale on 26 January because of a knee injury. Kelly was instrumental in their march to a first ever Leinster title in December and played through the pain barrier in order to do so. Rested until October’s county final against Straffan, having jarred his troublesome right knee – which required surgery on a ruptured cruciate ligament in 2011 – Kelly had to take a major pain-killing injection before the Straffan encounter. That enabled him play through the county final and the entire Leinster campaign although the pain returned in the final ten minutes of the provincial decider against Hunterstown Rovers on 2 December. Scheduled for a routine cartilage operation soon after that game, Kelly expected to be fit in time for the club’s all-Ireland semi at the end of January. However a check-up last Thursday (2 January) showed further complications in the knee. Kelly rang Gilroy last Thursday evening to tell him the news. “He found it hard to talk,” Gilroy revealed. The manager then had to break the news to his Two Mile House squad after training that evening. “The players were devastated. But we’re still in the game. He could have got a black card in the first minute against Emyvale. At least now we can work around it,” said Gilroy, who has also been sweating on the fitness of county minor Chris Healy. Healy hasn’t trained since the Leinster final because of a knock he suffered in that game although Gilroy expects him back in time for the Emyvale game on 26 January. Nathan Sherry was another injury concern with a hamstring problem but like Healy, he should be available for the game. Despite their small size, Two Mile House have made giant leaps in recent years and this year reached the Kildare minor A football final. 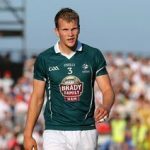 Star forward Mark Sherry captained the county minors to Leinster glory in July while Healy was one of Kildare’s outstanding players in that run to provincial success. Manager Gilroy has targeted a place in an all-Ireland club final, something no other Kildare club has managed to achieve. “When we won Leinster, I said to them we want to be the first Kildare club to reach an all-Ireland final,” said Gilroy, who managed his native Ballymore to the 2010 Leinster intermediate title. The Kildare-Wicklow border outfit lost out to eventual champions, Lisnaskea from Fermanagh, in the all-Ireland semi-final. Without Kelly, the House will have their work cut out against an Emyvale side featuring Ryan McAnespie, who was part of the Monaghan minor team that won the 2013 Ulster title. Emyvale beat John Mitchell’s from Birmingham in their all-Ireland club quarter-final before Christmas. Kelly’s absence will also hurt Kildare as they begin their National League campaign on 2 February, which leaves new manager Jason Ryan without one of his best defenders for the early stages of a tough Division 1 campaign. Ryan is also without last year’s captain Eamonn Callaghan, Eoin Doyle and Niall Kelly for the opening four rounds of the league.